Do we even imagine what we will be when we grow up? I’m not sure if our neighbour Allan Gillard did, when he lived in South Brook so many decades ago. Many people may not even guess at what their lifelong love and passion will be. On the other hand, perhaps Allan did draw and paint even back then and enjoyed it very much! If I ever get to speak with him, I will ask him. JUst a few days ago I learned that Allan is also a musician, so he is a multi-talented individual! It amazes me that he has so many gifts to share with others! Allan is the brother of Neil, Marilyn and June Gillard. I remember when they attended Holy Rosary School in Pasadena. Marilyn was in my grade so I knew her best of all. Allan is also the nephew of Ben Gillard, and I have several of his art prints, one print in particular is of the school I taught in for fifteen years. I was surprised when I went to buy the print at the Avalon Mall, and Ben happened to be there at the time. He was very courteous and he came out to speak with me for a few minutes. I told him I already had his lobster print and liked his work very much. I did ask him about Neil and Allan at that time. Many of you probably do not know what a talented person Allan is, so I will show you some of his artwork. In the article below from The Evening Telegram, you can see his painting “The Red Door”. Look at the detail in his paintings and the colors, so real that you feel like reaching out and touching each door, leaf, or puffin. One time at school I wanted to do a display about trains in Newfoundland and this print would have come in handy. No one on our staff had the print and I had no idea where I could reach Allan Gillard, so I did the display without it. In the back of my mind, I continue to search for it and know that one day I will have it displayed on my living room wall! My brother Brian also had a print of the Steel Rail Waltz. (Thanks, Nikk for this piece of information). He is fortunate to have such a unique piece by his South Brook neighbour Allan. I offered to buy it from him, but he didn’t want to part with it, although he did promise he would try to get a copy for me. He is so busy these days that I’m sure that’s the last thing on his mind when he returns home to Newfoundland after working away for weeks at a time! So I will continue to search and perhaps one day this print will miraculously show up at my home in St. Shotts or Torbay! Note: If anyone knows where I can purchase a copy of the train print, please contact me in a comment or email. Thanks! This entry was posted in Childhood Memories, Teenage Memories and tagged accordion, Allan Gillard, art, Atlantic Puffin, Ben Bellows, Ben Gillard, Pasadena, South Brook, Steel Rail Waltz, The Red Door. Bookmark the permalink. You are right . That door is very realistic. I can almost feel the peeling paint crumble in my hand! You should get back to painting, too. I know you enjoyed it once upon a time. I don’t have much talent in that area! Hi..The name of the piece that you referred to in your article about Allan Gillard is Called the Steel Rail Waltz..The subject is not Clev Best…but Ben Bellows. You can find Al’s original “magic wood realism” on CanadianListed.com ..I don’t know if you are aware but Al is also a great musician..and one heck of a guy. We had Christmas dinner at his place in Richmond back in 2002. I remember going to the freezer for ice cream and there was a frozen bird in there..lol. It was the subject of one of his paintings. If you grew up in South Brook, then you probably know one of Al’s best friends, Eugene Seaward…I believe Eugene owns some of Allan’s original pieces. So does Robert Bateman. Thanks, Nick. Glad you corrected the name of the musician. Liked the title! Finally, I have important details! Nice hearing from you! And no, I didn’t know Allan is a musician. Just wanted to let you know I spoke to your mom at Pasadena Come Home Year celebratons. I also chatted with your very talented brother who happened to be at the museum that was set up for the week. I didn’t know your father once held the record for the biggest baby in Pasadena, until my Uncle Joe Whiffin came along at 16 pounds. Thought I would pass this along to you. Your mom and brother look wonderful and I was so happy to see them. It’s amazing how often I nearly had this print, that I mentioned in this blog. I heard from Allan’s brother’s girlfriend and she had just given away their extra copy of the print and would have given it to me(or sold it to me), had she seen this blog post. I’m always intrigued by the people I hear from each week and how generous they are. Thanks, Renee, you sound like a very kind and interesting individual! Love to have coffee or a meal with you and Rob sometime you are on the Avalon Peninsula. I might add that Rob is a musician as well. A very talented family! If anyone knows where I can purchase the print Steel Rail Waltz, please contact me. If you have tons of money and just want to give it to someone who will appreciate it every day, send me a message. Thanking you in advance! I will be visiting Pasadena this coming week and staying with Aunt Madeline. So if you want to be a part of our Pasadena book come visit. And if you have a copy of Allan’s print feel free to phone me at 686-2257. That is if you are selling it! We have been reading some of the replies and my wife Barbara and I knew Allan when I was stationed in Corner Brook in the 1970 ‘s in the RCMP. We went to the first art show that Allan ever had and purchased 2 of his wood burnings. It was in 1978 or 79. An old Eskimo man and woman. Allan advised these were the first 2 wood burnings that he did as a professional artist. We have since purchased the rights from Allan to make prints. We have yet to do so. The last time we saw Allan and his wife Muriel was at his home in Tors Cove about 6 years ago. At that time he was working on a wood burning for the Calgary Stampede. We have remained friends ever since. He is an amazing artist. We enjoy our wood burnings very much and hope to purchase another some day. Frank Jenkins. Good to hear from you! I’m still interested in a print of the train, but I don’t buy many prints any more. Mostly I’m trying to get rid of the excess of collected art I possess. Say hello to Allan next time you see him. I heard Erin Best and Sandy Morris play last Thursday night. Wonderful talent! Merry Christmas to you both! I have a limited edition print dated 1995 by Allan Gillard of a toddler standing back on underneath a pier with a row boat in the background. Would this be the same Allan Gillard? I have no idea but if Allan or a relative reads this message perhaps he or she would know. 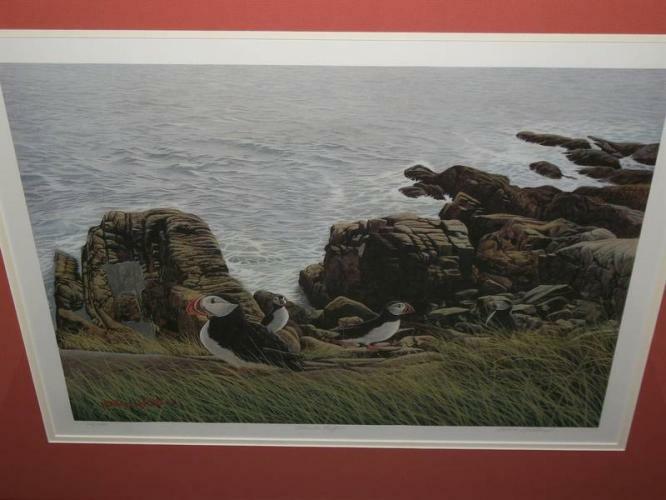 I have a print of his with a puffin on it. The landscape is very detailed and colorful. The print I have looks more like a pencil sketch, quite beautiful but wondering if it is rare or not. I know he used to do woodburnings. I think that is what the train print is. If you like it , it is valuable to you. I think I did a blog post about the Newfoundland Hotels print. I paid only a quarter for it but it is worth at least $500 framed. It is not for sale. I did pay a lot for framing. The memories it evokes will last a long time. The print is quite valuable to me, it looks exactly my my son when he was that age, people have asked me if it was him. I would just like to find out more about the artist and the print. I actually bought it at a yard sale for 5.00 and it was also professionally framed! Beautiful detail in it! What I wrote in my blog post is all I know about him. Some friends of Allan’s left good information. I liked the comments from people who know him. Read them if you havent already done so. It is one of my most popular blog posts. Hello, our store, Wapiti Road Shell in Grande Prairie, Alberta owns an Allan Gillard painting and we would love to know its title. It is of an old man in a cowboy hat with a pipe and a pouch while standing in front of a team of horses (Barney & Babe). The is from Wanham Plowing Match in Northern Alberta in June 1999. It is done is the sepia tones (at least I think that is what the cream and brown tones are called). I am trying to do up a plaque to hang beside the picture so having the title would be wonderful. I have no idea but if anyone knows, please leave a comment. I’ve removed surname, Tanya. I’ve never heard from Allan so I’m not sure if he will respond to you. Good luck! Please give credit for my piece on him. I have gotten many hits on this blog post. Great page! Well done! Perhaps you can list a link to where someone can buy his work. I have not talked to Allan in 10 years. Allan was employed by me for a few years in Richmond, British Columbia. A wonderful gentleman. He was gracious enough to give me a number of his excellent art works. I have not had the opportunity to contact Allan over the last decade. I have scanned a brochure of his works. It has 20 images. If you want the scans, add a comment and it will be emailed to me. No, I’m still with an eye out. I don’t spend much money these days. I save it for travel, self care and to treat my family. Thanks for asking. I could not figure out how to get the images into the WordPress blog message. Probably should have asked. However what I did today was upload 6 scanned pages of Allan’s brochure on Flickr.com. They can be viewed without login by going to Flickr home page and type in Artist Allan Gillard in the search box at the top of the page. Or type just Allan Gillard. I am thinking, Picture it in a frame in corner has the print you are talking about. The man playing the accordion in the wood burning picture is my brother Ben Bellows. Ben and Allen were very good friends. Ben passed away a couple of years ago. So sorry to hear about Ben’s passing. I’ve had two people who said they would give me this print. I rarely buy anything these days so I’ll wait a little longer. Recently I’ve been buying Gerald Squires and Mary Pratt prints. I save my money now for travel and self care. I also treat my grandchildren once in a while.